On Sept. 8, Bishop Miege held its “Gold Out Game” against Gardner-Edgerton. The contest helped spread awareness and raise funds for St. Jude Children’s Research Hospital. “It was a very emotional week just because nobody should have to go through that, especially little kids,” Miege quarterback Carter Putz said. A young girl named Avery has battled cancer and health hurdles. She was named Miege’s honorary captain for the game. After the Stags’ pregame talks, Putz saw Avery on the sideline. He walked over, and she gave him a hug. Putz took Avery out to the middle of the field for pregame festivities. “I had tears running down my face seeing him do that,” Miege coach Jon Holmes said. Avery gave Putz a bracelet. He still wears it every day. In the contest, Putz completed 15 of 15 passes for 252 yards with four touchdowns against no interceptions in a 48-0 victory. Putz, the two-time Kansas Gatorade Player of the Year, led Miege to its fourth straight state title. Overall, he finished 37-2 as a starter and set state records for career passing yards (9,336), passing touchdowns (124) and single-season passing scores (50 in 2016). 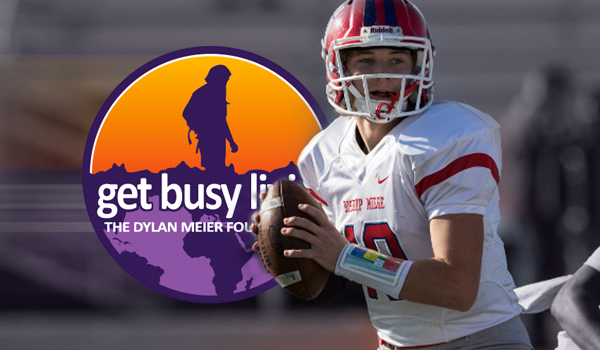 The elite combination of Putz’s on-field performance and off-the-field leadership allowed him to be capture the seventh annual Dylan Meier-Get Busy Livin’ Award. The prestigious honor is given to one Kansas senior and serves as the Kpreps.com Player of the Year Award. The award is in honor of Dylan Meier, a former All-State quarterback at Pittsburg High School and starter at Kansas State University who died in a hiking accident in 2010 at the age of 26. The annual award goes out to one who not only has shown excellence on the field but also has demonstrated the values that Dylan embodied and Get Busy Livin’ (GBL) strives to promote: adventure, fitness, curiosity, and a daily zest for life experiences. The annual GBL 5k race will be this Saturday at Hutchinson Football Field located next to Pittsburg Middle School. Start time is 8:30 a.m.
Holmes, a Bishop Miege graduate, played against Dylan Meier in his final game as a Stag, a 2001 Class 5A first-round 27-12 playoff loss. Pittsburg eventually finished as Class 5A runner-up, the Purple Dragons’ last title game appearance. After the contest, the teams collected their things and finished a postgame meal. Holmes and his fellow seniors walked back onto the field for a final time. Meier came and shook the seniors’ hands. Holmes still remembers Dylan telling the Miege players that he “felt like we were a really good team.” Holmes followed Meier’s career at Kansas State. Holmes, part of an extended run of elite success as an assistant and now head coach at his alma mater, has often nominated players for Meier’s award when he believed the Stags had a worthy recipient. “This year to me was a no-brainer,” Holmes said of nominating Putz. Putz becomes the first Miege player to win the Get Busy Livin’ Award and joins an elite group of recipients that includes Shawnee Mission North’s Will Schneider, Rossville’s Tucker Horak, Bishop Carroll’s Denzel Goolsby, Shawnee Mission West’s Austin Chambers, Lawrence’s Brad Strauss, and Madison’s Kole Schankie. “When you read about Dylan and kind of what he did and kind of what he stood for, to me that’s kind of what Carter Putz is,” Holmes said. Putz is the oldest of three brothers. He has strong ties to Notre Dame, including both of his parents being born in South Bend, Indiana. A standout infielder, Putz was offered by Notre Dame early in his high career and has never wavered from his baseball commitment to the Irish. “I love football, and that was my first love, but the chance to go to my dream school and play baseball there, it’s just too hard to pass up,” Putz said. Last fall capped a long quarterbacking career that started in elementary school. In fourth grade, Putz began instruction from Justin Hoover, a longtime Miege assistant and a well-known quarterback guru throughout the Midwest. Putz started younger than many quarterbacks. “I just really had a passion for it and really wanted to be as successful as I could, so we just tried to get going as soon as I could,” he said. Hoover has developed multiple Division I quarterbacks. Putz labeled Hoover a “big reason” for his success. “That’s probably my biggest role model right there,” Putz said. Putz had another rare opportunity to learn as a freshman. Miege went from Montell Cozart to Ryan Willis, both Division I quarterbacks. In 2014, he traveled to every varsity game and charted each play for Willis, a role normally given to a coach. “He was a student of the game,” Holmes said. Before the ’15 season, Putz beat out Landry Weber and earned the starting quarterback position. Weber eventually became an all-state receiver and is now on Kansas State’s roster. “He was able to get the ball out on time to the open receivers,” Holmes said. “He was just really smart about what he was good at doing and made sure that he did it. Putz passed for at least 2,844 yards a season and completed at least 69 percent of his passes each fall. His processing and ability to break down plays helped him achieve one of the state’s memorable moments in 2017. He broke the state mark for career passing TDs with a 98-yard score to sophomore Daniel Jackson in a key moment in a 27-14 Week 3 win against St. Thomas Aquinas. Holmes called the pass his most memorable Putz play. Putz still readily recalls the conversations, formation and his thought process behind the touchdown. They split Jackson out wide and called a go route. Putz noticed the safety was playing on the hash mark, a little bit inside. “Danny is a phenomenal athlete, and I knew that he was going to beat his man off the line, so I just took a three-step drop, hitched and kind of threw it as far as I could into the wind a little bit,” Putz said. Last year, Miege was going to have an all-school assembly to present Putz the Gatorade honor. Putz, perpetually humble, didn’t want the attention. Next to the Jackson play, his most favorite pass came in the sub-state game against De Soto. Putz found senior Peyton Hamrick, one of his best friends and a teammate since third grade. Hamrick had 22 career catches. His only catch in the DeSoto game went for 22 yards and helped Putz set the state’s career passing yards record – surpassing the mark set by 2016 GBL Award winner Will Schneider of Shawnee Mission North. Putz loved enjoying the moment with Hamrick, a role player throughout his career. “To me, he is the same kid he was when he walked into the school as a freshman, and I think to have the type of success he had, and to see a kid that is still so humble, still very appreciative,” Holmes said. In the summer, Putz mixed football and baseball and never missed a weight lifting session. Often, especially Tuesdays and Wednesdays, Putz went from football weights to baseball practice. When Miege had youth football camp, Putz came back from practice to help with the youngsters. In the last several years, Putz helped many times with Exceptionals, a summer T-ball league for special needs players. He assisted with Harvesters food bank and multiple other events. Along with Putz, other 2017 award finalists include Jack Barger of De Soto, Milton Braasch of Shawnee Mission East, Dylan Freberg of Blue Valley North, Dalton Kuhn of Smith Center, Braden Howell of Bishop Carroll, Cole Strickler of Pike Valley, and Dexton Swinehart of Lyndon.